Successful Selling to Type: SST®, a sales education program designed to improve communication skills, was delivered to thirty–three representatives of GHP. 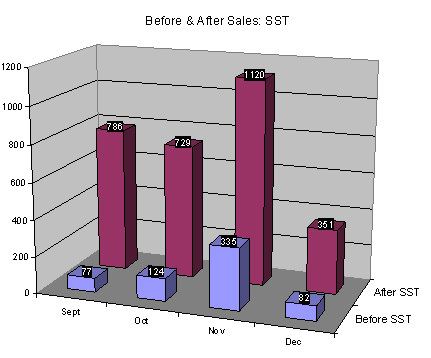 Comparisons of sales made following SST training (September – December) were made to the same time period for the year prior (September – December). Post SST performance showed sales increased by 483% over the prior year. Differences were statistically significant at the .01 level of confidence. Performance of GHP sales representatives who did not participate in SST showed a decrease in performance when compared to the prior year. All but one representative trained in SST performed at a higher level following the training. Five of seven representatives not trained in SST showed performance declines.